Shake with ice and strain into a Collins glass with 2 oz of soda water. Top with ice, add a straw, and garnish with mint and a blackberry picked to a lime slice. As a first drink at the Baldwin Room at Sichuan Garden II, Andrea asked bartender Joel Atlas for the Torino Highball. Joel mentioned that this recipe was a collaboration between bartenders Ran Duan and Vannaluck Hongthong. 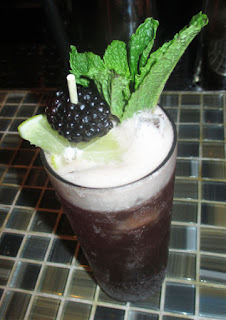 Once in a glass, the Highball presented a mint aroma with a darker note from the blackberry garnish. The crisp, carbonated sip offered dark berry and grape notes, and additional aspects of the blackberry and grape flavors rounded out the swallow.